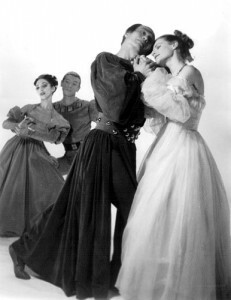 With The Moor’s Pavane, Jose Limón compressed Shakespeare’s Othello into a 21-minute, single-movement work featuring Limón himself as Othello along with his close collaborators Betty Jones (Desdemona), Lucas Hoving (Iago), and Pauline Koner (Emilia), with music by Baroque composer Henry Purcell as the score. The title and the style of dance allude to Renaissance court dance (Pavane). Limón danced with Doris Humphrey‘s group for years before founding the Jose Limón Dance Company in 1946, with Humphrey as co-director, although he continued to be known as a dancer perhaps more than a choreographer because of his commanding onstage presence. Limón’s dance method continued many of Humphrey’s principles of movement, including “fall and recovery” (see my post on Doris Humphrey) and a balance between weight and weightlessness. The characteristic movements of his dances, as seen in The Moor’s Pavane, follow the gravity of the limbs’ to their natural conclusion, with a combination of upwards movements emphasizing height (e.g. broad leg gestures) while the dancers maintain a grounded stability and a fairly static, upright torso. There is also often parallelism in the dancer’s limbs (arms moving in coordination with legs in opposing directions, for example in turns and circular movements) creating a graceful, broad, and clear effect lacking unresolved tensions. In the introduction to the film of The Moor’s Pavane, Limón states that he seeks to tell the story of Othello through gesture. Accordingly, the structure of this dance is driven first and foremost by the narrative rather than by an abstract emotional concept or idea about movement itself. The gestures generally appear to focus on the relationships between the four characters, illuminated by their physical relationships and interactions with each other (aggression, tenderness, intimacy, suspicion). The dancers typically face each other, often making eye contact, rather than dancing outwards towards the audience. This format reminds me somewhat of classical ballets (e.g. Tchaikovsky classics), but here the story’s development is at a decidedly faster pace. Clearly narrative gestures are fluidly interspersed with duets and quartets that bring Renaissance court dance to mind in their tight group coordination and graceful, statue-like poses. The broad skirts of the period costumes obscure much of the two female dancer’s lower-body movements, but by covering the dancer’s bodies in an unnatural way the costumes help to create character, drama, and historical stylistic allusion. Limón’s dancing—as exemplified by The Moor’s Pavane—emphasized the depiction of emotions, literary inspirations, narrative, character, and is coordinated with music in a clear (but not irritatingly direct) way. It is interesting to contrast Limón’s direction with the path of Merce Cunningham, for example (only about 10 years Limón’s junior), who left the Martha Graham camp to establish a form of dance that broke away traditional concepts of narrative, emotional expression, and the relationship of dance to music in the way that his partner John Cage challenged traditional concepts of music. Get a free blog at WordPress.com | Theme: Hemingway by warpspire. Modified by Nell Shaw Cohen.